Flavor Text: He lurked in the perilous Vale of Pnath, but his knowledge was so vast, many dreamers risked the danger to seek his counsel. Very useful, good cost to skill and set it to night to suit the other ghouls. 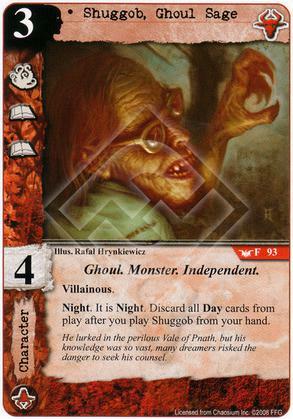 Yes, day cards discard him but Shub should be the least worried about this. All the good ghouls require night to be effective so a ghoul that makes it night is really useful. Almost an auto include in ghoul decks.